The luxurious Drei Berge apartment complex is located in the village of Viehhofen, close to the famous Saalbach Hinterglemm. The practice slope is right next door, as is the exit from the slope from Saalbach Hinterglemm. On the 1st floor you have a spacious and luxuriously furnished apartment which was completely refurnished at the end of 2015. In addition to the attractive living room, furnished with authentic details, with a beautiful open kitchen, you have no less than 3 bedrooms, 2 bathrooms and an extra toilet. The sunny terrace is really huge and overlooks the beautiful surrounding mountains. There's a spot reserved in the parking garage for the car. 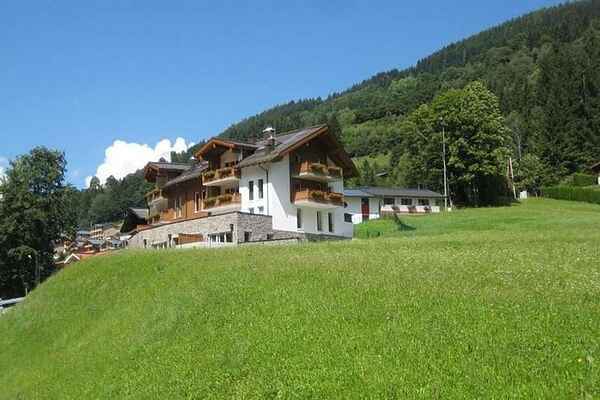 In just a few minutes you can be in Zell am See, Kaprun and Saalbach/Hinterglemm from Viehhofen. This is also a desirable location in the summer. New development! Starting from the winter 2019/2020, there will be a lift from Viehhofen directly to the skiing area of Zell am See. This will mean that Viehhofen will be both connected to the skiing area of Zell am See and with Saalbach-Hinterglemm through an ascent from the skiing area (the lifts of the skiing area of Saalbach Hinterglemm can easily be reached with the free ski bus). The expectation is that there will be ski buses to both skiing areas.